What am I doing when I search for something on the internet and the search provides for some other interesting stuff apart from what I was looking for and I end up opening an infinite number of browser tabs and browsing more and more it goes in an endless loop and the whole episode makes for after thought to ponder upon. PS: I lost the term I had found on Wikipedia and I cannot get it back. Tab-surfing, also more accurately known as 'Branching' is a type of link-surfing in which, rather than click directly through to the next web page, the link is opened as a new window or new Tab. This method is used by people wishing to read as much information as possible on a variety of subjects which may or may not be related. Link surfing is the process of starting on one article on a website and clicking on various hyperlinks to eventually finish on a different (pre-determined) article. There are all sorts of web browsing details here. To enter into a situation or begin a process or journey that is particularly strange, problematic, difficult, complex, or chaotic, especially one that becomes increasingly so as it develops or unfolds. "Owning your own business is a huge responsibility that not everyone is prepared for. Are you sure you're ready to go down the rabbit hole?" "I've stayed away from drugs and alcohol since coming to college. I have an addictive personality, so I decided to just avoid going down that rabbit hole altogether." "Overhauling the current tax legislation is a rabbit hole I don't think this administration should go down at this point." It's probably a reference to Alice's Adventures In Wonderland, (often referred to as Alice In Wonderland) which starts off with the titular heroine following a strange looking rabbit down a hole, after which all sorts of strange events unfold. In addition to the other answers, a specific example of the phenomenon when applied to wiki pages (such as Wikipedia, or TV Tropes) is often referred to as a wiki walk. Randomly following Wikipedia links and reading articles, which ends up wasting a lot of time. The longer the walk, the more unrelated the articles become. XKCD calls this a "tab explosion". I would describe this state by saying that you are in a clicktrance. A degenerate state of computer usage where you stop caring about accomplishing anything or bettering yourself in any way. The only thing that remains is to click on random hyperlinks in your browser, look at the similarly random pages they link to, then click on something else and forget everything you just saw. 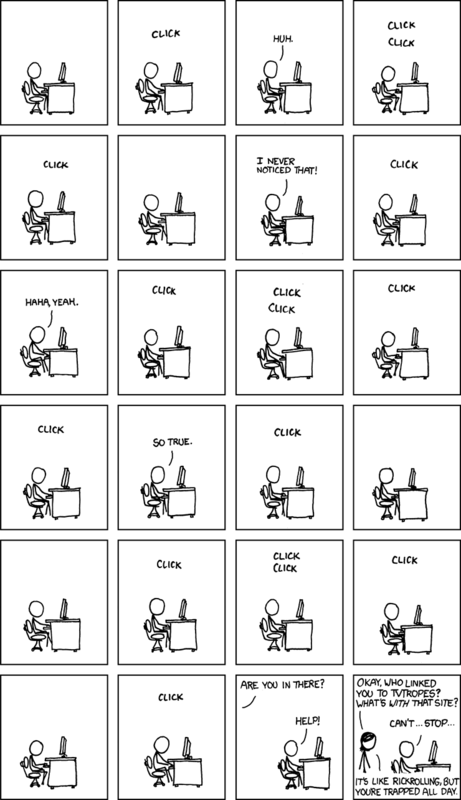 Can also refer to similarly meaningless clicking in games like minesweeper. More generally, I'd use simply "sidetracked" or "distracted." Is there a term for browsing the web and ending up very far from the original article? What is it called when something is unimportant for several years, and then it becomes important?